This page is dedicated to our hafla's that I hold twice a year, and our fund raising efforts that form a big part of our events. 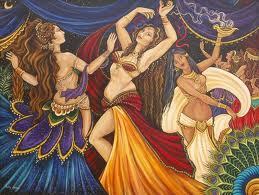 "Hafla" is Arabic for party or celebration, and what I organise is exactly that! It is a party where my troupes along with visiting dance troupes come together to perform for an audience made up of other dancers, friends and family. There is a mixture of troupe, duet and solo performances. Everyone buys a ticket in advance to attend the hafla and the profit raised from ticket sales along with raffle money is donated to a chosen charity. There are usually several stalls for people to browse and buy if they wish. The venue we use also has a licensed bar and ample parking. Each time I organise a hafla I am open to suggestions as to which charity we choose to raise money for. Occasionally it may have stemmed from one of my dancers having had personal experiences or help from a particular charity, or they may nominate a charity that they believe does great work for the community. I like it when the charity is local to our area and even more so if it is a smaller, less recognised charity as the money then really does make a difference for them. I always ask if a representative of the charity would like to come along and see what our event is all about and to tell us a bit about what our donation will be used for. I have been organising haflas for many years now and they have grown in size and popularity! Therefore the grand total we have raised to date is £16,018! Below is a list of charities we have supported over the years and the amount donated to them. If you would like to donate a prize for our raffle please get in touch, we are always very grateful!